Kayak fishing has been one of the fastest growing subdivisions of paddlesports for a number of years. With more and more people taking to the water in a kayak experiencing the ease of use and accessibility it brings. 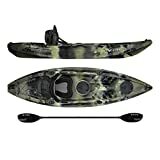 Entry level boats can be bought for less than $500 but by spending just a little more on your Fishing kayak investment you can pick up some really exciting boats with even more great features. We already know you can pick up some great boats that all cost less than $500. However, there are some terrific fishing kayaks that didn’t make that list because their prices went just a little bit over $500 and less than $1000. For a little more expenditure the quality of the boats vastly improves with added features such as rod holders and better seating options. If you want to really get into kayak fishing then we recommend something from this price band as it gives the user a better experience with options to further customise and expand your fishing kayak. 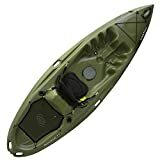 The Moken 10 Lite from Feelfree is one of the best kayaks under $600 (unfortunately the price has gone up to $699 at time of writing but it’s such a good boat I’m going to leave it here) for a little more expenditure the Moken 10 lite is unbeatable value. The boat is much the same as its bigger brother the Moken 10. But this stripped back version doesn’t strip back on quality or functionality. The fishing kayak is sold in a number of really exciting colour options. With the very functional uni track system, something not found on the standard Moken version. The Uni Track system allows accessories to be added effortlessly with no drilling of the hull. This combined with the two rear flush mounted rod holders allows for maximum user friendly configuration. The Kingfisher seat from feelfree is both adjustable and comfortable with foam seat pad and backrest. The front hatch and centre console are easily accessible storage options with the large rear tankwell perfect for additional crates. One of the best features of the Feelfree Moken Lite has to be the inclusion of the wheel in the keel something very popular on other Feelfree models. The wheel allows for easy transport and moving the kayak even fully loaded without the use of additional wheels or carts. Ideal for short coastal paddles just past the surf or taking on bass in your local lake, the Feelfree Moken 10 Lite won’t require any heavy lifting. This kayak is a smaller, nimbler version of our standard Moken 10 kayak with some added features like our new Uni-Track accessory system for kayak fishing. Between its weight and our proven Wheel in the Keel, getting around with the Moken 10 Lite is a breeze! Stable, light and compact when it comes to fishing kayaks, you won’t be disappointed with the Moken Lite. The Pescador from Perception is the compact version of Perceptions best sellers the Pescador Pilot and the Pescador Pro which we reviewed in our best fishing kayaks. The Pescador is equipped with two rear-mounted flush rod holders and one centre forward mounted holder. The comfort seating system is comfortable and user friendly with an adjustable backrest. The Pescador has plenty of storage space with the front hatch and the rear cargo area. The Pescador can be used by all the family both on the beach and for all out fishing. The Perception Pescador 10.0 kayak versatility makes it popular for both recreational paddlers and anglers. Extreme stability ensures a drier ride that’s easier to get in and out of. The 325 lb. capacity rating packed into a 10-foot kayak means plenty of room for you and your gear. The short length and lighter weight eases transport and increases manoeuvrability. Ample storage, fish-ready features, and an incredibly comfortable seat keep you on the water for longer. If you have a little more cash to spend I certainly recommend you check out the Perception Pescador Pro Model this boat comes with even more comfort and functionality. It is less suited to family use but as a performance fishing platform the Pescador Pro is the perfect companion. The Renegade XT from Emotion kayaks is `simple yet effective the kayak is kitted out with a supportive backrest and plenty of storage. The rear gear cover is the perfect option to keep things neat and organised. The Renegade XT™ Kayak is a user-friendly sit-on-top kayak that accommodates larger paddlers with comfort and stability. It features a spacious tankwell with cargo net lacing that is big enough for a small child or a dog to ride in. The solid and supportive backrest along with the removable seat provide all day comfort. The integral stern and side handles make carrying the kayak to and from the waterfront easy for everyone. This model comes standard with 2 rod holders and a Solace Hatch for below deck storage. the Renegade has the versatility, handling and speed to perform in all types of conditions. 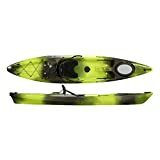 The Striker from perception kayaks is the largest of the boats reviewed under $600 at 11”6 the Striker is as at home on the sea as it is on a lake. The two tier moulded in seat is less comfortable than other designs but the height difference offers a variety of fishing positions and a good foot and leg position with a standing area and stand assist strap. The striker is extremely stable. Perception is well known for their quality and durable recreational designs. The Striker is no different, If you are looking for a great boat with some great features to offer maximum fishing performance in this under $600 package. If you are looking for increased comfort and performance take a look at both the Pescador Pilot and the Pescador Pro which we reviewed in our best fishing kayaks. 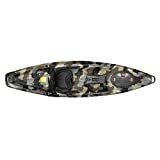 The Perception Striker 11.5 kayak is extremely stable 11-foot-6 design makes fishing and cruising fun for any ability. This roomy sit-on-top is drier than comparable models and offers the freedom to sit low, sit high, or stand for optimal paddling and casting comfort. The 500 lb. capacity rating means maximum room for you and your gear. Ready to fish, it includes large rear storage, two dry storage zones, four molded-in rod holders, a molded-in ruler, and paddle mounts for hands-free fishing. No track system to aid additional upgrades. The Vibe Kayaks Skipjack is our best fishing kayak under $500 and also represented in our best fishing kayaks for 2018 This is why it’s also made the grade as one of the best fishing kayaks under $600. Because the Skipjack offers one of the best value packages available to get you on the water, The kayak is sold as a user friendly package including the Paddle and deluxe backrest.The kayak is both stable and user friendly. It is light weight and an ideal boat for all of the family to use. The Vibe Skipjack is fitted with 4 flush mounted rod holders as standard. The Kayak is just 9ft so is better suited to short distances but can be used both in fresh water and on the sea. The Skipjack is available in 3 different colour options. With so many great features and all for under $600 this is really worth taking a look at. Whether a beach toy for the family or an introductory fishing platform this fishing boat can really be used by all the family. Vibe Skipjack 90 delivers great manoeuvrability and stability in a smaller package. It’s smaller size means greater portability and flexibility while still being fully equipped. The Skipjack 90 package comes equipped with a paddle, deluxe seat and 4 flush mount rod holders. At 46 pounds, this kayak is easy to handle and even fits in the back of many SUVs.